WatchOS 5’s new 'Activity Competitions' feature turns calorie burning into a week-long game. You don’t need an Apple Watch Series 4 to get a lot out of watchOS 5. Consider my situation: As a couple of my Twitter followers have suspected, I tumbled off the weight loss wagon for a bit (and let that serve as a reminder about what I said about weight loss being mainly about willpower). But now I’m back on it again with my still-capable Apple Watch Series 3, thanks in large part to the new ability to take part in fitness competitions with my fellow Apple Watch-wearing friends. In fact, it’s made me more excited about the prospect than ever before. Competitions aren’t entirely a new feature; they just make existing feature more convenient and give them more structure. 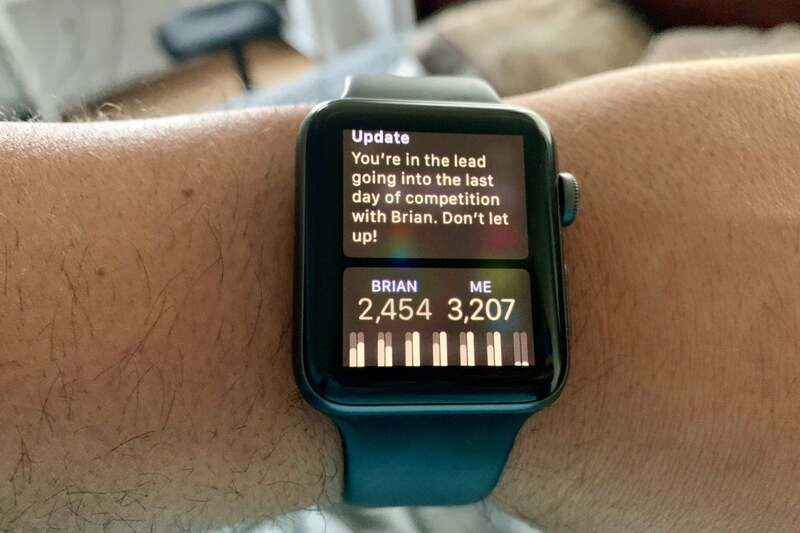 Before, I’d get little taps from my Apple Watch’s Activity app letting me know when my connected friends had completed a workout or closed all their rings for the day. It was motivation through guilt. If I saw that a friend had closed his rings before I did, it’d give me that extra bit of determination to walk around the blocks a few times to close my own rings. It wasn’t perfect; there were plenty of times when I knew I was too far behind to make a difference, and so I wouldn’t even try. “I’ll try again tomorrow,” I said, much like a procrastinating dieter. 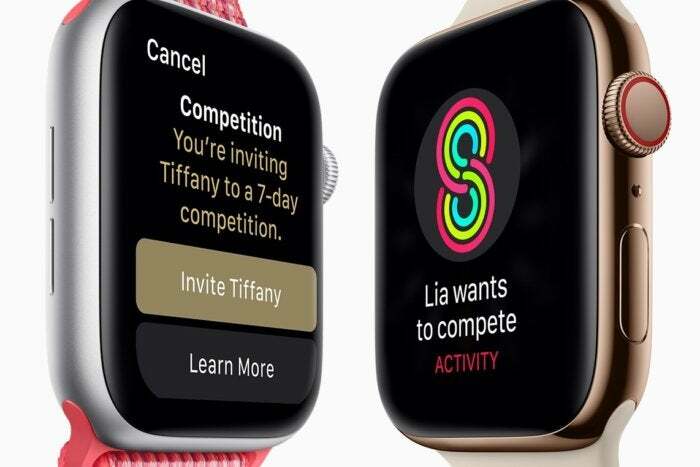 Competitions in watchOS 5 downplay the guilt and emphasize the fun. They’re week-long contests in which you try to outdo your friends at burning the most calories for the week. They’re also easy to start: Simply visit your friend’s ring status in the Apple Watch Activity app, invite them to compete, and you’re off (provided they agree). You don’t get any prizes aside from the rush of victory and maybe some smug satisfaction, but that’s enough for me, as week provides more than enough time for me to make up for some early stumbles. You don’t get any prizes for winning aside from a spiffy badge (and you still get a different one merely for competing), but it complements my competitive streak in a way that merely looking at graphs never did. Starting is the easiest part. In my case, Competitions seem to work best when you’re up against someone with a similar lifestyle. No gym-crazy athletes for me: No, I threw down the gauntlet before my friend Brian Armstrong in Seattle, whose life reasonably resembles mine. We’ve both got desk jobs. We’ve both got too many extra pounds. We probably play too many video games. Heck, we’ve both got goatees. He’s got an edge on difficulty over me in that he’s also a husband and father, but overall he’s about as good as a rival as I could hope for. Last week’s competition was good for both of us, and I think we took it more seriously than either one of us expected. I was expecting an easy win; after all, I’ve been spending most of my evenings with someone who takes me on miles-long romps along local beaches and through canyons. For that matter, Brian keeps his active calorie goal set at 600, as opposed to my more ambitious 700. Before, when Brian would close his rings before I did, I’d laugh it off and say he was cheating. Not this week. Brian’s been taking this competition thing dead seriously. On one day I was expecting to be able to rest a bit after hoofing several miles over San Francisco’s Inner Sunset district, but then I looked down at my watch and recoiled in horror to discover that Brian not only wasn’t behind but that he was somehow ahead. Brian, it turns out, had started going to the gym again. I couldn’t let that happen. And so I pushed myself harder than I have in months. In fact, I found myself in a gym myself, courtesy of the friend I normally walked with. When I started this experiment in losing weight with Apple, I vowed to stay out of gyms until I’d reached a, well, less embarrassing weight. But I couldn’t let myself lose because of such cowardice. And so on Saturday I spent the day jogging on treadmills, navigating imaginary rivers on rowing machines, and doubling my Move goal for the third time this week. For the first time in months, I find myself wanting a gym membership. This was the big breakthrough for weight loss that I’d been hoping for ever since I started this project, and I don’t think I’d have reached it if we hadn’t started our little competition. It helps that Competitions aren’t the only fun new fitness feature in watchOS 5. 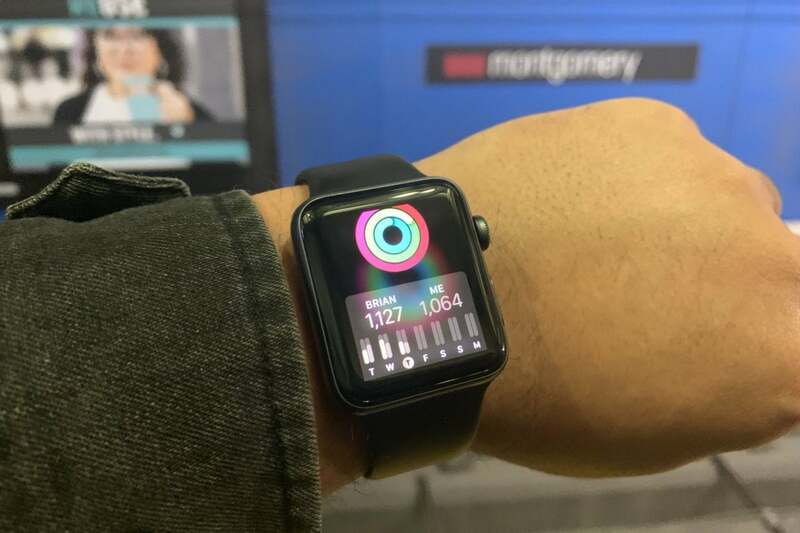 Along with a lot of new workouts, the Apple Watch now asks you if you’re doing as workout after it registers some familiar motions. I get this a lot when I’m walking the half-mile from the train station to work, which allows me to count that as a “Outdoor Walk.” When I say yes (and I almost always do), it retroactively records the rest of the time you’ve spent walking as a workout. I find this hugely motivating, as it makes me realize I’ve been “working out” far more often than I would otherwise. Workouts, I’ve noticed in such moments, seem to register calorie burns more liberally than if I just let the watch do its things. And so my rings close a little faster. I find myself getting off at earlier bus stops on the way to home or work. More importantly, I get a little leg up on Brian’s progress. I was sure he was going to win at first. It also helps that it’s super easy to tell how well the competition is going. I tend to keep my Apple Watch set to the Activity Digital or Activity Analog watch faces these days, which immediately shows the competition stats after a simple press of the rings on the display. (This also works if you have Activity set as a complication on another face. Up pops the Competitions screen, showing my massive lead in calorie burn over my friend, along with the status that our little spat ends today. It’s not quite as effective as having the Competition listed on the watch face itself, but it’s close enough. I’m well aware that this approach works for us in part because games are the foundation of my friendship with Brian. We spent a lot of evenings trying to do better than dozens of other players in PlayerUnknown’s Battlegrounds, and with Competitions, we’re each trying to do better than each other. Competitions give us a clear goal to shoot for—one that wasn’t really there when we were limited to peeks at each other’s rings. I just told Brian about this article. He tells me he can’t wait to read it, but with an angry emoji, he tells me he’s hitting the gym in a bit. The competition ends at midnight, so he still has enough time for an upset if he pushes himself really hard. So it’s time to cut this short. After all, I’ve got calories to burn. I’ve got competitions to win. And for the first time in a while, I’m looking forward to it.